According to the BBC MPs are demanding to know why the white goods manufacturer Whirlpool ended a product replacement scheme for dangerous tumble dryers. The Commons business committee says one million of the defective machines remain in UK homes. Last week, a coroner blamed a fault in a Whirlpool dryer for a 2014 fire that killed two men in north Wales. Whirlpool has ended a £50 replacement offer to consumers who are still in possession of faulty tumble dryers, after stating that demand for the replacement scheme fell, according to the company. The decision by the group – which said it is still offering free repairs – has caused it to come under fire from MPs once again, with Business, Energy and Industrial Strategy committee chair Rachel Reeves writing to Whirlpool UK Appliances communications director Ian Moverley at the beginning of November. Reeves asked the company in her letter why it has decided to end its replacement scheme “when there are one million defective tumble dryers still being used in households across the UK”, adding that the company failed to mention the end of the scheme at the recent committee it attended on the safety of electrical goods in the UK and the UK’s product safety and product recall regimes. “It is completely unacceptable that Whirlpool has shut down its replacement scheme for these dangerous tumble dryers,” said Which? home products and services managing director Alex Neill. Given that in April MP’s called for the Government to step in and force a recall of more than 3.5m faulty Whirlpool tumble dryers which pose a “risk to life and limb” one would think that Whirlpool would act and not wish to seem complacent to its customer base? They didn’t and have been routinely accused of inaction and only acting when forced to and even then in a case of too little, too late. 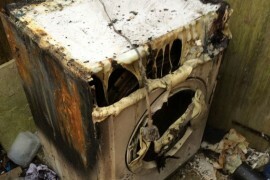 Even after the Grenfel disaster in June were in one single incident of a fire involving a Whirlpool appliance caused 80 deaths there was still no action and now the withdrawal of the replacement scheme when according to reports there are still over 1m defective appliances still in UK homes is yet more evidence of Whirlpool putting the business before safety. Until Whirlpool are seen to act against this growing fire safety scandal every news item about Whirlpool on this site will have the tag #whirlpool-hotpoint-creda-indesit-fire to link all Whirlpool news and not allow the appliance giant to dilute the (negative) safety news with positive brand messages about what new features its products have. Despite all the awards and achievements Whirlpool boast about, at heart your safety isn’t something it puts first so just think about that before you put one of their appliances in your home as some reports have shown, the appliances are not limited to tumble dryers when in use, but as in the case of Grenfel, a fridge/freezer was reported as the start of the blaze and these appliances are not turned off when you go to sleep at night.